How Does Metal Recycling Help the Economy? 08 Jul How Does Metal Recycling Help the Economy? Metal recycling is advantageous to our society in a number of different ways. One of the biggest upsides of metal recycling is the way in which it benefits our economy. The question is: how? How does metal recycling in Chicago help our economy? Read on to find out! The economic benefits of metal recycling can be seen on a few different fronts. Not only does metal recycling pump money into the economy, it also creates jobs and helps to reduce the price of goods. Read about its benefits below. Today, recycling is an industry that makes up a meaningful percentage of the United States workforce. In fact, millions and millions of the jobs located within this country are here because of recycling. Metal recycling, in particular, accounts for a few hundreds of thousands of these jobs; that’s no small number. Therefore, by engaging in metal recycling, you are essentially helping to create jobs in the United States. These jobs come at all different levels, benefiting everyone in our workforce regardless of social or economic class. The more rare or scarce that something is, the more expensive it is as well. This is a simple rule of economics. It applies to everything, and metal is certainly no exception. It’s for this reason that we should recycle our old metals. When we don’t recycle our metals, fresh metal ore must be mined. However, as more fresh metal ore is mined, metals become more and more scarce. The result of this? Our metal products start to rise in cost. All of a sudden, a car that used to cost $10,000 could very well cost $12,000 a few year later. We can all do a part to help keep metal costs down. The fact of the matter is that the metal recycling industry pumps hundreds of billions of dollars into the United States economy every year. It is a vital cog in our country’s economic system. Attempting to replace it with an equally lucrative industry would be a difficult challenge. Instead, we can all play a role in keeping the metal recycling industry growing. How do we go about doing this? By recycling our metals on a regular basis. Do you want to keep the prices of metal products down? Want to help create American jobs? Want to help our economy thrive? If so, metal recycling is the key. With that said, you might be wondering which metals can be recycled. The truth is that the vast majority of metals can be successfully put through the recycling process. 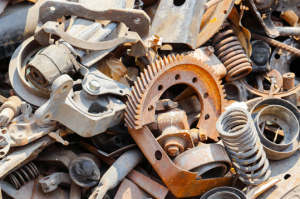 Commonly recycled metals include steel, iron, aluminum, brass, and copper. You might also be surprised to hear that the metals which exist within your electronics, known as e-scraps, can be recycled as well. Wondering how you should go about recycling these metals? The best option is to work with a Chicago metal recycling company. Such a company will purchase your scrap metals from you, then recycle them at their facility. Looking to Recycle Metal in Chicago? Interested in helping the economy? Looking to recycle metal in Chicago? If so, we here at Central Metal Recycling are the people to see. Whether you own a business or are just a homeowner trying to get rid of some metal items, we can help you. We recycle metals of all kinds, from iron, to steel, to aluminum, to E-scrap, and more. We also pay top prices your metals, offering cash payments on the spot for all purchases. Contact us today to chat! My husband and I have accumulated a considerable amount of scrap metal, and now we’re considering getting it recycled. You had some great points about the benefits of metal recycling like this, and I liked how you said that metals which exist in our electronics, known as e-scraps, can be also be recycled. Thanks; we’ll keep this in mind when deciding if we should recycle our scrap metal.